CinematicFanatic Toolbar is the PUP that uses misleading techniques to prevent removal. Use Reimage to locate malicious components and get rid of them faster than with uninstall instructions. A full system scan blocks virus reappearance and prevents traffic to malicious domains. CinematicFanatic Toolbar is an extra system tool that can affect Chrome, Firefox, or even Safari web browsers. After installing it, you will find CinemaFanatic extension added to each of your web browsers, and you should also find a new shortcut added to the menu bar that links to an extension page. For example, users of Chrome will find themselves on chrome-extension://bpkmogbhibhnpebcaipnknfkgibdheoc/stubby.html page after clicking on the provided shortcut. On top of that, the browser URL bar will show the name of the extension. Clicking on it will trigger an information message saying “You’re viewing an extension page.” The aim of this extension is to change browser’s “On Startup” settings, or, to be precise, start controlling this setting. 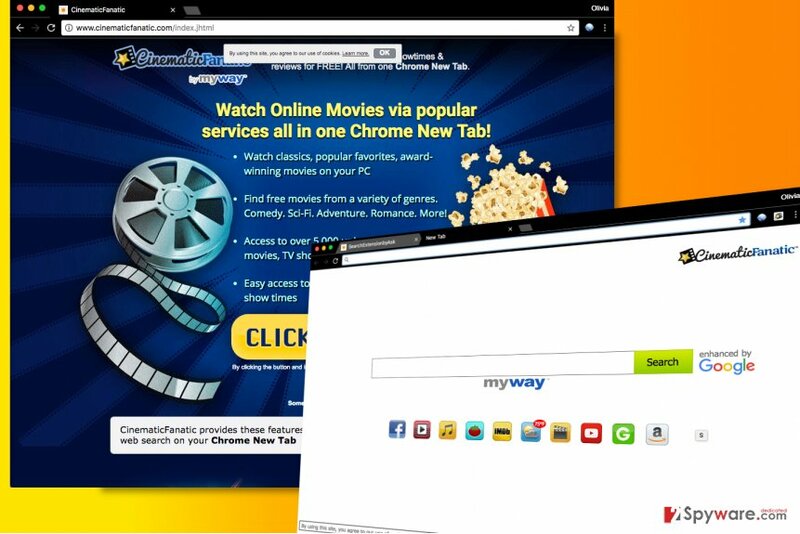 The new extension will ensure that affected browser will send all of your search queries to int.search.myway.com search results (enhanced by Google), which will be full of paid search results. This can become an enormously annoying problem when trying to find information that you need, especially when you’re in a hurry. If you’re not interested in search results that are filled with ads, you might want to use a different search engine. Before you can assuredly change browser’s settings, you have to remove CinematicFanatic Toolbar from your browser. For that, you can use anti-spyware programs or instructions given below the article. Researcher shows CinematicFanatic Toolbar search page. This website becomes default browser's start page and default search provider as soon as the user installs the CinematicFanatic extension to the browser. Many browser toolbars have their own official websites that suggest installing these browser additions for free. However, many browser toolbars are also advertised with the help of software bundling, a technique that allows software distributors to force users to install certain programs without knowing it. Therefore, we must warn you to be careful when adding new programs to your system. It is extremely important to check setup settings and set them to Custom/Advanced option instead of simply relying on Default/Standard ones. The installation settings that are suggested to you automatically typically include permissions to install third-party programs that display ads or change browser settings. You do not need such programs in your life, so do not forget to decompose software packs via Advanced/Custom settings. Recently, the developer of this program contacted us asking us to remove this post from 2-spyware.com website. 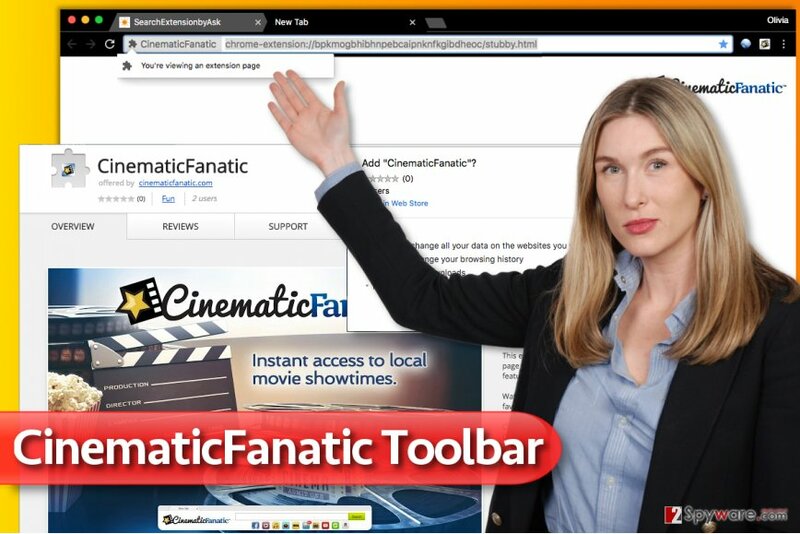 We believe that we shouldn’t do that as long as programs that we offer for the removal of CinematicFanatic Toolbar can detect it and help users to remove it from the system. As it is mentioned under each of download buttons, we ARE affiliated with these anti-malware programs, and while some of them are free, others can remove a virus only after purchasing them. These mentions fully fulfill each of the requirements of FTC. If you do now want to watch online movies that CinematicFanatic suggests to you, or simply if you do not want to sacrifice your default start page settings just to see some shortcuts leading to Facebook, Hulu, IMDb, Rotten Tomatoes and other websites that you can add to your bookmarks whenever you want, remove CinematicFanatic without a hesitation. You can use instructions we provided or run a system scan using anti-spyware software for best and quick results. Follow the provided guide to uninstall Cinematic Fanatic from your computer system and also to remove extensions that it added to your browsers. Here, look for CinematicFanatic Toolbar or any other recently installed suspicious programs. Wait until you see Applications folder and look for CinematicFanatic Toolbar or any other suspicious programs on it. Now right click on every of such entries and select Move to Trash. When in the new window, check Delete personal settings and select Reset again to complete CinematicFanatic Toolbar removal. Once these steps are finished, CinematicFanatic Toolbar should be removed from your Microsoft Edge browser. Here, select CinematicFanatic Toolbar and other questionable plugins. Click Remove to delete these entries. Now you will see Reset Firefox to its default state message with Reset Firefox button. Click this button for several times and complete CinematicFanatic Toolbar removal. Delete the unwanted extension using this guide. The extension should be called Cinematic Fanatic. Here, select CinematicFanatic Toolbar and other malicious plugins and select trash icon to delete these entries. Click Reset to confirm this action and complete CinematicFanatic Toolbar removal. Here, select Extensions and look for CinematicFanatic Toolbar or other suspicious entries. Click on the Uninstall button to get rid each of them. Here, look at the Homepage field. If it was altered by CinematicFanatic Toolbar, remove unwanted link and enter the one that you want to use for your searches. Remember to include the "http://" before typing in the address of the page. Now you will see a detailed dialog window filled with reset options. All of those options are usually checked, but you can specify which of them you want to reset. Click the Reset button to complete CinematicFanatic Toolbar removal process. This entry was posted on 2017-05-29 at 10:51 and is filed under System tools, Viruses. You can quickly scan the QR code with your mobile device and have CinematicFanatic Toolbar manual removal instructions right in your pocket. How did you remove CinematicFanatic Toolbar?